Mini and the iPhone | What Car? 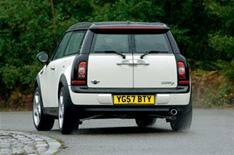 Amid the hullabaloo surrounding the introduction of the Clubman to the USA, it was easy to miss the fact that Mini has made all its models compatible with the latest must-have gadget, the Apple iPhone. The system allows the driver to use their phone and its audio functions, with software automatically pausing music if a call comes in, and then continuing it again when the conversation is ended. The telephone works through the loud speakers, with all information displayed either on the radio display or, if fitted, on the sat-nav, which has the additional benefit of allowing you to work the iPhone using the sat-nav's joystick control. To listen to music, the iPhone must be plugged into a cable adaptor that also charges the phone.